Home Artificial Intelligence What Potential Do Chatbots Hold For The Enterprise? Over the past few years, a lot of buzz has been generated around terms such as ‘chat bots,’ ‘smart personal assistants,’ ‘artificial intelligence,’ etc. Whether it is Amazon’s ‘ Alexa ‘ or Apple’s ‘Siri’ or google’s ‘Assistant,’ all major companies have started incorporating their own intelligent assistants for their respective businesses. Facebook has added more than 11,000 chatbots to its messenger app, since the launch of its chatbot platform in April 2016. In layman terms, a chatbot can be defined as a computer software program which can converse with a human by both textual and auditory methods to assist him/her perform different tasks. Today these tasks can include activities such as searching for a product, weather reporting, customer care, etc. From 1966 to 2017, chatbots have evolved continuously along with the changing trends in the technology sector. While early chatbots such as ELIZA and PARRY were designed only to simulate limited text conversations, Today’s chatbots have a variety of functional features which include web search abilities, gaming with human opponents, etc. The adoption of text and speech technologies by various organizations continues to grow. Enterprises have recognized the growing need for a smart way of engagement and communication with their users, in a world of millions of apps. Chatbots fill this need perfectly and enable a one-one experience for users. However, for the purpose of this blog, we will focus only on B2B & B2E scenarios. What role do bots play in a B2B environment? In the B2B space, bots play a vital role in addressing the needs of an organization’s customers. Customer service (as we discussed earlier) is an excellent example. 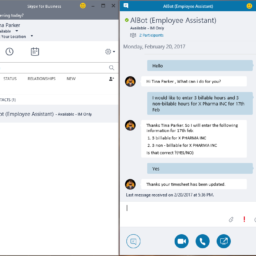 Bots help in reducing burden on an enterprise’s call center. Another use case would be supplier service. Large organizations that use the supplier network, or franchise model can introduce bots that can perform the first level of service. In the B2E space, bots can ease the procedures of service oriented functions such as HR, legal, payroll, administration, finance etc. Employees usually have a lot of queries regarding these areas and bots can assist by providing the first level of service. Bots can also help people that monitor these functions. For example, while writing a contract, the concerned employee can use a legal bot to find the right document template. In addition to these scenarios, bots can also be customised based on a specific requirement. For instance, bots can help your sales team members by notifying them about their performance metrics, revenue information and by alerting them if there are any dips in their KPI. Chatbots are continuously evolving to take over various administrative tasks related to the enterprise. With a chatbot around, employees no longer need to hover around the HR department for every small issue. Chatbots can provide real-time self-service option to all users. These services could include leave application and management, employee onboarding, setting up reminders, etc. By integrating AI chatbots into various messaging platforms, it is possible to provide an instant and natural language interaction to all users. Enhancing the natural learning interface of a chatbot can provide a good user experience. A well-built chatbot can increase overall user engagement and boost employee work productivity. For example, let’s consider chatbots like push and pull bots. While push bots prompt a user to take action or engage in a conversation, pull bots are manually operated by the employees to obtain the required information he/she needs. Depending upon various requirements of the organisation, push and pull bots can be used in a smart way to increase the organisational productivity. Organizations are finding it extremely difficult to provide 24/7 customer support to their clients. A chatbot can be a good replacement as it won’t have any time restriction. It can instantly answer a consumer’s query in the most efficient way possible. This helps in increasing the consumer retention and engagement as he/she doesn’t have to wait for a human for basic assistance. It acts as an app manager! Today an employee needs to use dozens of apps and programs while working. Finding and extracting relevant information can be time-consuming. With the help of a ‘light-weight’ chatbot with minimum UI, the user can speak to the bot or just type a message for acquiring all the data he/she needs in the shortest possible time. There is a high possibility that a customer who visits your website or explores your app may not understand all the services you provide. In such cases, a chatbot can help him/her with easy access to all your offerings according to his/her preferences and requirements. In a world where time is everything, the customer can spend the bare minimum amount of time in understanding all the services your enterprise can offer. Though we’ve come a long way from where we began in 1966, we have a long way to go. The future of a chatbot in the enterprise depends a lot on the advancements in AI. The only way chatbots can truly simulate a real human-like experience is through advanced natural learning processing and improved machine learning algorithms. To achieve this progress, the first step would be to accumulate an enormous amount of data, which can be altered constantly. The biggest challenge for chatbots is mimicking real life conversations between humans in the most convincing way. By using accumulated data, chatbots can be made to replicate a human communication and embrace better personalisation. With most users hitting their saturation point after constantly using a lot of apps on a daily basis, we might see a better collaboration and co-existence of chatbots and apps in the future.